The peacock network has reportedly ordered five additional scripts for Chicago Fire. The news comes a few days after NBC ordered five more scripts for sitcom Guys with Kids. Chicago Fire follows the working heroes of Chicago Firehouse 51; the firefighters, rescue squad, and paramedics. The stresses of their jobs affect their personal and professional relationships and often have long-lasting reprocussions. The TV show’s cast includes Jesse Spencer, Taylor Kinney, Lauren German, Monica Raymund, Charlie Barnett, Teri Reeves, David Eigenberg and Eamonn Walker. The new drama hasn’t been a big success in the ratings thus far. 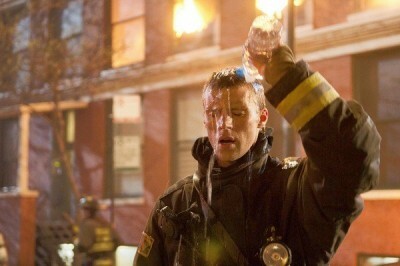 Chicago Fire debuted to a disappointing 1.9 rating in the 18-49 demographic with 6.61 million total viewers. In week two, the numbers dropped to a 1.5 rating with 5.85 million. Last night, the numbers perked up a bit and landed the 1.8 rating with 6.3 million, per the fast affiliates. Aside from Friday’s Grimm, Chicago Fire is currently NBC’s lowest rated hour drama. The network’s ordering of five more scripts for Chicago Fire is likely a way to keep the show on track while the network execs watch the next few weeks of ratings and decide if they want to put any more episodes into production. What do you think? Have you been watching Chicago Fire on NBC? Do you think NBC should order more episodes or should they cancel it instead? I love this show it is one of my favourite shows to watch and I really enjoy watching please keep adding more episodes. Oh yes yes yes…. we love Chicago Fire… I have several friends that are into as well. My mom loves it as well. Keep it going… its a great show and ever character on it makes it Chicago Fire! Keep this show on the air, you show to quickly I used to work for a rating company and this show is my family favorite. I am very disappointed that there have not been any new Chicago Fire shows. This is my favorite show. You have to give it time for people to watch it and hear about it. It is a fantastic show and I will be devastated if it is cancelled. Please continue to show new episodes before people give up on it. In the world of DVR everyone watches shows at their time. Please give it a chance this show is terrific!!! I think the sow is awesome, look forward to it every week. Characters are starting to grow and there are some great stories starting to develop. Keep the show on the air.